One way to turn bowls without screw holes is to use cloth backed double-faced tape to secure the bowl blank to the faceplate. 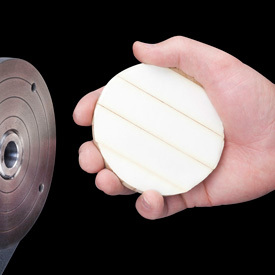 If the bowl blank is true and in balance, double-faced tape will hold it to the faceplate during turning and finishing. We have turned numerous bowls up to 10 inches in diameter and 2 inches thick without any problems. For maximum holding power, make sure that both surfaces are flat, clean, smooth and dust-free. Clamping the work piece and faceplate together ensures a strong bond. When you place the work on the lathe, give it a tug to make sure the bond is sure. When removing the finished piece, wedge a wood chisel between the wood and the faceplate. Use slow, steady pressure and the tape will begin to stretch then let go. Do not use on wet wood.